En papillote translates to cooking in a parcel, and is a marvellous technique to use for fish - which need to be cooked tenderly. What could be better than opening a steaming hot, aromatic parcel at your dinner table? Cooking en papillote means the fish cooks in its own juices, which adds flavour and leaves you with moist, tender flesh. There is an element of worry involved in cooking en papillote - ideally you shouldn’t open the parcel until you get to the table, so it can be tricky knowing when the fish is cooked. To test if it is cooked, you can press the fillet through the paper - it should feel ‘flaky’ to the touch. Fillets of fish are often cooked in this style, however small whole fish can also be used such as trout, sea bream or sea bass. For a bit of theatre, serve the parcel at the table for the diners to open up themselves - just take care not to burn yourself on the hot steam! The flavours you place in the bag will infuse into the flesh of the fish, so make sure that they complement the chosen ingredient. Andy Waters cooks his salmon and shellfish with wine, leek and chervil, while Josh Eggleton uses Pernod, fennel and tomato - just make sure any ingredients used can be cooked in a similar amount of time to the fish. 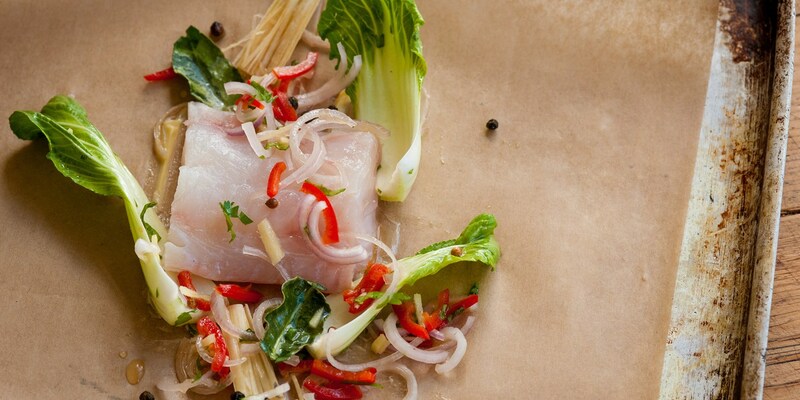 Shaun Rankin’s highly aromatic Thai-style haddock in a bag is infused with flavours of lemongrass, kaffir lime and ginger.